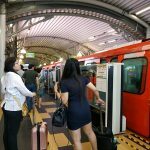 As Malaysians, most of us would enjoy roti canai or roti telur as either breakfast, lunch or for tea time. Usually served with curry, dhal and sambal- it is quite filling. At from humble stalls, you can get it for about RM1 a piece (of most as the more high end the store is, the more expensive). 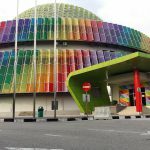 Usually, we would eat at the mamak restaurants- it cost less than RM2 per piece for the usual roti canai (roti telur, where an egg is added is more expensive, but more filling). 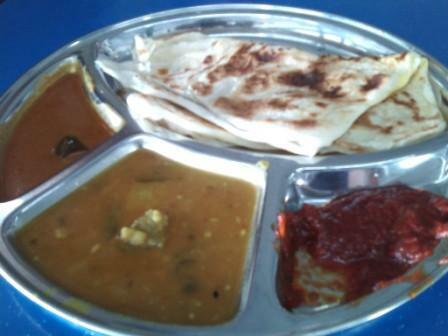 Roti canai is made using a lot of oil- so together with the gravy, the caloric content is relatively high. For those who is cutting down on oil, usually they would order a plain thosai. 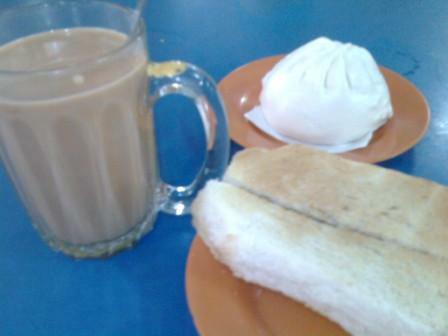 Below is some breakfast that Chinese folks like to have: milk tea (teh), a pau and toasted kaya bread with butter. 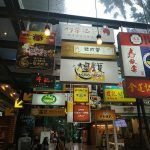 If you get from places like Pappa Rich or Old Town Kopitiam, it would be quite expensive- but the ambiance and free wifi would make up for your cost. Whereas if you order from the marketplace, it usually cost less than RM5 for everything.